There is like (maybe) five minutes of spoken dialogue in this movie. The absence of spoken words, in itself, forces you to pay closer attention. Central cast is a small set of four (six if you count old dude and little guy). Wait – seven! There was also the infant. I am hooked. First time I saw it I was not able to read the subtitles (used to translate ASL dialogue). Even without that ability I was able to clearly understand the whole movie and remain enthralled. Second time I saw it (last night) I was able to see the subtitles and it added clarity for a handful of points. Holy. Crap. Amazing. I highly recommend it to people who enjoy thriller movies. It was not your “jump ’em out” kind of horror flick. It was a solid “thinker” kind of movie. Anticipation and thrill. Krasinski did a great job at non-direct story telling. Allowing us to piece together bits by things we see/hear in the background. All central actors are solid in their own roles. I admire Krasinski for using an actual deaf actor to play the role of the daughter who is deaf. In the near future I will watch Wonderstruck, her first movie. She perfect casting in this. Emily Blunt was also perfect in her role, very believable. It helps to have two married people playing a married couple – the connection is already there, they anticipate each other… The sound crew deserves an Oscar next go-around. For a movie without dialogue, it makes you realize the importance of all the other “sounds”. Almost as if they are amplified in the absence of spoken word. The monster itself: they studied cadavers while coming up with the model for the creature. The use of a cochlea looking “ear” within the creature was spot on. I loved that it was encased within the creatures head, as protective as possible – which makes sense as it was the greatest weakness and needed the most protection within the creature’s body. In reading about the movie, I see that red lights emit a higher frequency of sound than other lights. I have enjoyed the YouTubers who have shown me everything from “origins of the aliens in Quiet” to “things you missed” to “did it kill everyone else”. I love smart videos that show the plot holes, easter eggs and technical explanations. Those can sometimes further solidify my respect for a movie. I have never seen a single episode of The Office. Not sure why. It was never a draw for me to binge even. I love actors from the show. It just never was a draw. I might watch it soon. Not sure. I do know that I want to see more serious Krasinski roles. Just wow. Have you seen it? Did you like it? Let me know in the comments below. IMDB Synopsis: In a post-apocalyptic world, a family is forced to live in silence while hiding from monsters with ultra-sensitive hearing. 1 Ugh – 2 Meh – 3 I don’t hate it? – 4 That was solid. – 5 Loved It! It received a Rotten Tomatoes rating of 95% Fresh. It received a Rotten Tomato audience rating of 84% liking it. Average Rating: 4.2/5 with a number of User Ratings: 16,370. John Krasinski played the monster in a motion capture suit for a few scenes. 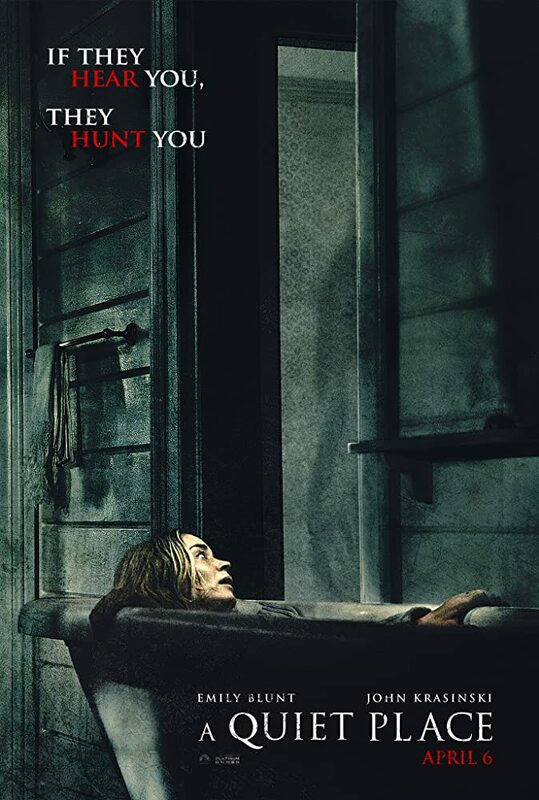 Actor-director John Krasinski has said that the single greatest compliment he received regarding the film, was in a tweet from the master of the horror story himself, Stephen King: “A QUIET PLACE is an extraordinary piece of work. Terrific acting, but the main thing is the SILENCE, and how it makes the camera’s eye open wide in a way few movies manage” (6 April 2018). None of the characters’ names are mentioned during the movie, with the exception of youngest son Beau, whose name appears in his room. The device Reagan wears is not a hearing aid, but a cochlear implant. This indicates that Reagan has a sensorineural hearing loss, which means her inner ear has sustained some sort of damage. The cochlear implant translates vibrations in the air into nerve impulses that the brain perceives as sound. The film was written by Scott Beck and Bryan Woods for Paramount, who submitted the script to John Krasinski to star. Krasinski’s wife, Emily Blunt, also read the script and then wanted to co-star in the film. In addition to starring in the film, Krasinski is the film’s director. Doors are never opened or closed throughout the entire film. Partial filming for the movie took place in Little Falls, New York. Significant location shooting took place on West Dover Road in Pawling, New York. While Evelyn is homeschooling her son Marcus, at the back on a white board, it reads the first four verses from Sonnet 18 by William Shakespeare. Copies numerous musical ques from Jed Kurzel’s score in Alien Covenant. During the scenes in Lee Abbott’s (John Krasinski) basement, you can see a variety of newspaper articles on the wall, with one headline proclaiming that “[A] meteor hits Mexico with the force of a nuke”, potentially alluding to how the creatures got to Earth. Simmonds actually made John Krasinski cry on set with a suggestion to change an important part of the script. During the climactic scene between Lee and his kids (in the truck), the original script just had him signing “I love you.” However, Simmonds suggested that he should sign “I’ve ALWAYS loved you,” which made Krasinski cry. As Regan visits her little brother’s grave, you can see ‘2016 – 2020’ inscribed on the headstone, which means the majority of the story takes place in the near future, circa 2021. That Blunt’s character began suddenly bleeding a large amount of bright red blood was not a normal part of early labor, and was suggestive that something had gone wrong in her delivery, such as conditions where the placenta is damaged or begins to prematurely separate from the mother’s body. These conditions can cause a lot of blood loss in the woman, the baby, or both. This explains both why Blunt’s character lost consciousness after her delivery, and why there did not seem to be a problem with the baby crying right after delivery. The baby was born before entering the sound proofed room and was fairly quiet as he was being carried down to the room in Blunt’s arms. The duration of silence from the baby after birth would be unusual unless there was a problem with the baby, such as blood loss, which was well explained by the sudden blood loss Blunt had in the bathtub. The man in the woods who sacrifices himself out of grief over his dead wife is played by Leon Russom. Russom played a character in season 2 of Prison Break (2005) who did not speak either, although it was to prevent his voice from being recorded.